Mad Skillz (now known simply as the recently retired "Skillz," the dude who does all of those pretty cool yearly "Rap-Ups") is a rapper from Richmond, Virginia who is most known for his debut album, From Where???. He got started when he finished in second place in a freestyle competition (he lost to MC Supernatural, arguably the most well-known freestyler on the planet) and, off the strength of his performance, landed a deal with Atlantic Records. Promptly, in 1996, Mad Skillz released his first single, "The Nod Factor," which was produced by The Beatnuts, and then dropped From Where?? ?, the album's title entailing a play on the fact that the Virginia hip-hop scene was not exactly popping back then. That being said, it's exactly like Virginia is a breeding ground for hip-hop today either, but it did spawn famous artists like Pharrell and The Clipse. Unfortunately for Mad Skillz, From Where??? hit the shelves on the same day as 2Pac's All Eyez On Me and The Fugees' The Score. So, not only did it not achieve much commercial success, but it garnered virtually no notoriety at the time, either. Nowadays, it is looked at as a cult classic, and because it is out of print, many fans consider it to be a collector's item (although you can get a used copy for a pretty cheap price on Amazon). From Where??? does feature production from the likes of J Dilla, Buckwild, Large Professor and The Beatnuts, Mad Skillz was able to collect some beats from some pretty well-respected producers. He made sure he went to work on this album, but didn't all rappers make sure they did that back in the mid 90s? Anyway, it's pretty clear from the first time you hear Mad Skillz that he sounds a hell of a lot like Big L (so much so that it's actually kind of creepy), and that alone makes a lot of hip-hop fans gravitate toward his sound. So, is From Where??? an overlooked gem? Let's decide for ourselves. Mad Skillz leads off with a J Dilla-laced song, and it knocks. Jay Dee utilizes a Sergio Mendes sample and throws some banging drums over it, and Skillz sounds built for the beat. You'll also notice that not only does Mad Skillz sound like Big L, but he also has a similar style in that he is a dope punchline rapper. The aforementioned first single. While the Beatnuts-produced track is solid, I was never in love with it. "The Nod Factor" just isn't on the same level of some of the other records on this album. Also, I'm not sure how much of a head-nodder this cut actually is, despite the fact that Skillz says "if you're not noddin' by now, you're either dead or a manikin." One of three Buckwild instrumentals on From Where???. While this isn't one of Buck's best productions, it's decent. The filter over the sample is pretty nice, and Mad Skillz sounds fairly comfortable. Not great nor all that impressive for a producer the caliber of Buckwild, but hardly bad, either. Mad Skillz himself crafts the beat here, and he does a damn fine job. It consists of a simple--but very effective--loop, and Skillz and guest artist Kalonji The Immortal glide over it. Now this is what I would call a head-nodder. I really, really like this a hell of a lot. Buckwild production No. 2. Unfortunately, this isn't any better than his first effort on the project. The bassline is nice, but other than that, the instrumental is fairly boring. Mad Skillz puts forth a decent performance, but it sounded as though he was half-asleep. Maybe the beat bored him, too. This is the best song on From Where???. Laced by Nick Wiz (one of the most criminally underrated producers in hip-hop history), this freaking bangs, as the drums are hard as hell and Mad Skillz sounds thoroughly stimulated. You also have to love Skillz saying "the only crossing over I'm doing is a motherfuckin' street," especially because he stayed true to that statement. This track is just awesome. Large Professor gets on the boards for "Extra Abstract Skillz," and he puts together an effective, hard-hitting beat that he even drops a verse on. Q-Tip is here, too, and he rips it. All I really have to say is that this is pretty dope. It pains me to say this because I'm such a big Buckwild fan, but he must have been asleep on the boards for his contributions on this album. After rather underwhelming efforts on his first two instrumentals, Buck loops Kool & The Gang's "Summer Madness" for "Get Your Groove On." That just screams lazy. This record wasn't terrible, but it comes across as rather amateurish for such an experienced and well-traveled beatmaker. This is the second and final Jay Dee production on From Where?? ?, and it's even better than the first. Dilla uses a haunting Dorothy Ashby sample for "The Jam" and crafts a rather unorthodox drum pattern to lay over it. Mad Skillz blesses Dilla's beat with a purposeful performance of his own. I've never been a fan of these types of instrumentals which, in this case, is laid down by DJ Clark Kent. Skillz doesn't sound bad, but he sounds best over productions that are considerably harder than this. Shawn J. Period produces back-to-back cuts beginning with "Street Rules," and he doesn't get off to a very auspicious start. This beat has absolutely no melody at all, making it sound very bland and lifeless. Once again, Mad Skillz comes correct to at least make the song respectable, but, also once again, the musical backdrop lets him down. Now this is much, much better. This time, Shawn J. Period drops a dark, somber instrumental powered by a piano riff that Skillz tears up. This entire album should have consisted of productions like this. It would have been a sure-fire classic if it did. It's also pretty appropriate that Shawn J. Period takes the "give me a fly beat and I'm all in it" line out of Gang Starr's "Mass Appeal" for the hook. If only Mad Skillz would followed that mantra throughout the whole project. This is a pretty solid posse cut, even if it consists of a bunch of dudes no one has ever heard of. The EZ Elpee beat is engaging, and everyone drops punchlines galore over it. It's worth noting that Mindbenda, the guy that raps third, sounds like a combination of a young Jay-Z and Papoose. Shawn J. Period is here again for his third go-around. Honestly, I'm not even sure what to make of the instrumental. It's all over the place, with a strange drum pattern and a very sloppy use of a sample. This isn't exactly the best way for Mad Skillz to close out From Where???. From Where??? is a very good album that falls just short of classic status. Like many of the other projects I have reviewed, there is just too much filler on here for me to laud it that extensively. Still, it's an entertaining listen, and it's not like Mad Skillz is the reason why the LP isn't an all-time great; it's the beats. Surprisingly, the main culprit for some of the lackluster instrumentals on From Where??? is Buckwild. Especially taking into consideration that this album was constructed during his prime, it's odd to hear so many murky Buckwild productions at once. Not one of his beats were really all that hard-hitting, and it kind of seems like he half-assed all three of his contributions. Thankfully, J Dilla saved Buck's behind, coming with two awesome instrumentals that Mad Skillz ate up. Plus, we had Nick Wiz on the boards for one production, and he laced the best song on the entire album ("Tip of The Tongue"). It would have been cool if he would have provided a couple of more beats for Skillz, but it is what it is. Looking past the production, Mad Skillz is a very good MC. He has a great voice, an on-point delivery and he is a damn fine punchline rapper. Big L enthusiasts will undoubtedly like him, and if you're a Big L fan who hasn't yet given From Where??? a listen, I'd suggest you do so. Just be prepared to weed through some rather bland instrumentals. 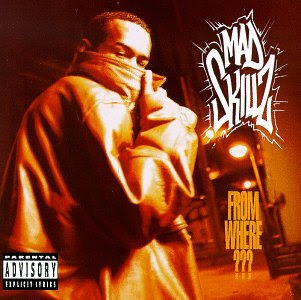 Since '96, Mad Skillz has dropped five albums, his latest work being the 2012 effort Thoughts Become Things, and as I mentioned earlier in the write-up, Skillz is now retired. Admittedly, I haven't listened to any of his other projects, but I might get to that soon. Maybe.